Published in Weber, Samantha, and David Harmon, eds. 2008. Rethinking Protected Areas in a Changing World: Proceedings of the 2007 GWS Biennial Conference on Parks, Protected Areas, and Cultural Sites. Hancock, Michigan: The George Wright Society. When Public Law 108-447 was signed on December 8, 2004, the U.S. Departments of Agriculture and the Interior were tasked with setting the price of a new annual pass for federal recreation lands. Effective January 2007, the new pass would offer entrance to recreational users on federal lands that charge an access fee, including but not limited to national forests, parks, monuments, wildlife refuges, etc. In May 2005, the federal agencies issued a national call for scholarly assistance in examining possible prices for the new pass. In June, the University of Wyoming, through its Wyoming Survey & Analysis Center, submitted a project proposal. In July, the Wyoming research team was selected to provide the assistance, through a cooperative task agreement (no. H-200040001) under the Rocky Mountain Cooperative Ecosystems Studies Unit. 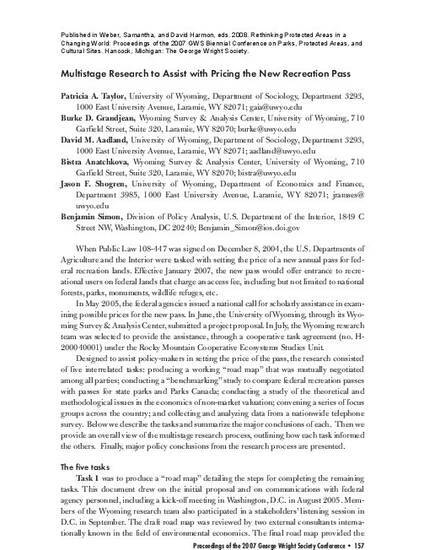 Designed to assist policy-makers in setting the price of the pass, the research consisted of five interrelated tasks: producing a working “road map” that was mutually negotiated among all parties; conducting a “benchmarking” study to compare federal recreation passes with passes for state parks and Parks Canada; conducting a study of the theoretical and methodological issues in the economics of non-market valuation; convening a series of focus groups across the country; and collecting and analyzing data from a nationwide telephone survey. Below we describe the tasks and summarize the major conclusions of each. Then we provide an overall view of the multistage research process, outlining how each task informed the others. Finally, major policy conclusions from the research process are presented.